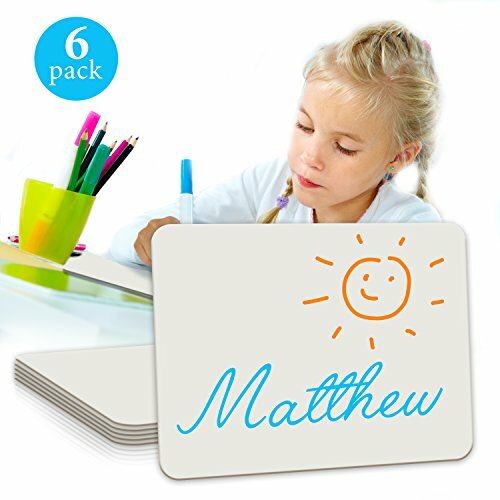 This durable dry erase board has a blank writing surface, so you can use it for math, spelling, penmanship and more. The 9" x 12" size is great for all grade levels and college students. The lap board provides a durable, clean dry erase writing surface on a 1/8" thick hardboard material. Every board has both smooth rounded corners and bulled-nose edges for added student safety and comfort. The large blank writing surface of each whiteboard gives students lots of room for writing so it can be used for math, spelling, penmanship and more.. Single sided to allow for a smooth finish backing for best comfort to hold in hand or place on lap. The lightweight design allows the boards to be easily maneuvered. Made with lightweight but durable material which makes it easy for students to use in a classroom setting, great for interactive effective learning, or even for use in bed for studying purposes. If you have any questions about this product by Scribbledo, contact us by completing and submitting the form below. If you are looking for a specif part number, please include it with your message.